Some tracks recorded by Lindsey Buckingham at home. Digital mix-down equipment furnished by Soundstream Inc.
Fleetwood Mac was formed in the summer of 1967 when guitarist Peter Green, drummer Mick Fleetwood and bassist John McVie left John Mayall’s legendary Bluesbreakers to create a new blues-based band with guitarist Jeremy Spencer. The group first performed in August of that year (with temporary bassist Bob Brunning) and released their debut album, Peter Green’s Fleetwood Mac, the following February. An immediate U.K. hit, the LP stayed near the top of the British charts for 13 months. English Rose, released in January, 1969, contained the hit singles “Black Magic Woman” and the instrumental “Albatross” (which hit the charts again when released in 1973). The group subsequently toured America with a third guitarist, Danny Kirwin. Green left the group in 1970 and shortly afterward McVie’s wife, vocalist Christine Perfect, was recruited. She had fronted British blues-rockers Chicken Shack in the late 60s and, along with Kirwin, moved the group toward a more melodic rock sound, as evidenced on the alum Kiln House (1970). Spencer subsequently departed and was replaced with American guitarist/vocalist Bob Welch, first heard on the album Future Games (1971). A series of further personnel changes followed which saw both Kirwin and Welch moving on. In 1974, Fleetwood Mac relocated to Los Angeles and it was there that guitarist/vocalist Lindsey Buckingham and singer Stevie Nicks joined the group. Along with Mick Fleetwood, John McVie and Christine McVie, Buckingham and Nicks completed the band’s permanent line-up. 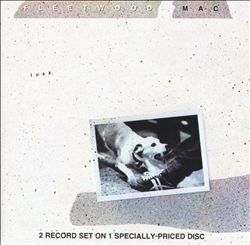 Fleetwood Mac, released in July, 1975, showcased this impressive combination of songwriting and performing talent. The album was an immediate success, yielding the hits “Over My Head” and “Rhiannon” and eventually selling over five million copies. It was followed in February of 1977 with Rumours, one of the most popular albums of all time. Featuring four smash hits, including “Dreams” and “Don’t Stop,” the album was Number One on the U.S. charts for more than 30 weeks and has sold a global 21 million copies to date. Following a world tour, the group returned to the studio to record a follow-up album. Two years later, in October 1979, Tusk was released. The ambitious, diverse, often experimental set was produced by Fleetwood Mac with Richard Dashut and Ken Caillat. It features 20 original songs, including such standout cuts as Stevie Nicks’ “Sara” and Christine McVie’s “Over And Over.” The title cut, written by Lindsey Buckingham, features the University of Southern California Trojan Marching Band. It was recorded live at Dodger Stadium. © (P) 1979 Warner Bros. Records Inc. Made in U.S.A. All Rights Reserved.